In a recent Epoch Times interview, Terence Quek, CEO of Emergenetics International-Asia Pacific—a global, human capital company—shared some of his childhood stories and what it felt like growing up in Jalan Bahagia City. 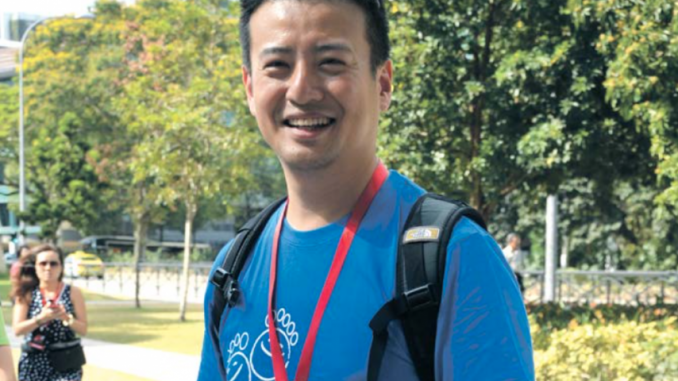 Mr. Quek, who is also the outreach director for Project Happy Feet, a non-profit, humanitarian organisation, spoke about the carefree days he spent playing catch, ‘hantam bolah’ and marbles with the kids in his neighbourhood. “I miss the simplicity of play and make-believe,” he said. “We ran a lot, climbed a lot, and fell down a lot – life seemed more carefree,” he recalled with a smile. Epoch Times (ET): Where did you live during your childhood years? Quek: Since my parents worked long hours, I lived with my grandparents in a HDB flat, in Jalan Bahagia. However, I spent most of my childhood years in the Whampoa/Balestier Road area. ET: Could you describe the house you lived in, the surroundings and your neighbours? Quek: I lived in a standard HDB flat, but of an earlier design. Actually, I lived in a block of flats. The building was 10 stories tall, and had a long corridor which ran through all the units on each floor. If you stood on the opposite block, you could see all the units at a glance. Most of the neighbours kept their doors open, so if you walked to the stairs in the middle of the block, you could see all the neighbours, many of whom were quite friendly. I recall playing with the neighbours’ kids, who were all around my age. ET: Could you describe some of your more memorable moments? Quek: I remember when my younger sister got bullied by a group of older kids and I rushed over to protect her. We all got into a bit of a scuffle, but no one was seriously hurt. We then parted ways. My sister regarded me as her hero, however, she didn’t know how scared I was! ET: What games did you and your friends play? Quek: We played catch, which involved one person chasing the rest of us as we ran and hid throughout the block. Although it was 10 floors of fun for us yelling, screaming kids, it must’ve been hell for our neighbours! We also caught tadpoles and fish in the local sewage drains. 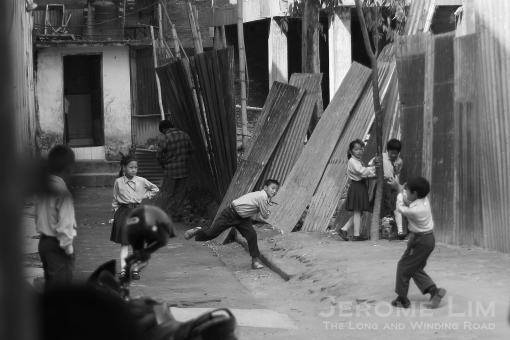 There was a giant, open court between the two blocks of flats, so we devised all manner of games including ‘colour’; (stepping only on certain coloured tiles while escaping the clutches of the catcher) and ‘hantam bolah’ (where we all lined up against a wall and dodged a ball that was being thrown by another kid). There was also kite-fighting (with strings that were coated with sharp, glass bits), marbles, ‘zero point’ (jumping over a rope made of rubber bands) and hop scotch. ET: Were there any particular games which you enjoy playing? Quek: We enjoyed a game called ‘Shark!’, which was played atop a concrete, tennis table. Basically, all the kids would stand on the table, with the ‘shark’ hiding below, trying to grab someone’s leg. It was quite exhilarating, especially when you had to stand very close to the edge because there were so many kids huddled on the table! ET: What do you miss most about Singapore’s yesteryear? And why? Quek: I missed the simplicity of childhood play and make-believe, and making the most of what we could find. For example, cardboard boxes became castles and forts, afternoon treats were bought from an ice-cream man peddling a push cart or a hawking, curry-puff seller. Appointments to meet up and play were most often kept, but because there were no mobile phones back then, it was hard to reschedule things. Kids of all ages played together. We ran a lot, climbed a lot, and fell down a lot—life seemed very carefree!